Keep connections to a minimum and throughput to a maximum. Stranded Core is more flexible and withstands more bending without breaking and is suited for reliable connections with insulation piercing connectors. Use our premium- quality color-coded CAT5e cable and RJ-45 modular plugs to create your own custom length network patch cables. 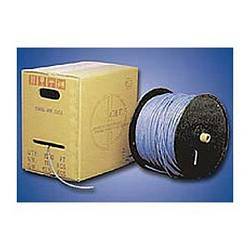 1000ft Bulk Roll with foot markings on cable to indicate remaining length.